That’s an important definition from a book I just cracked open at the behest of a long-time client and friend titled, Scale: The Universal Laws of Growth, Innovation, Sustainability, and the Pace of Life in Organisms, Cites, Economies, and Companies. Written by theoretical physicist and former present of the Santa Fe Institute Geoffrey West, the book seeks to leverage the author’s research as a pioneer in the field of transdisciplinary complexity science to make sense of the world we live in. If you, like me, prefer to read prose jam-packed with numbers, charts, and diagrams, rather than the oft-wrong but never-in-doubt opinions of a journo-blogger, then this is the book for you. It’s not necessarily an easy read, but that’s what the summer is for! How have you adopted to changing external conditions in our industry? For us, it’s been more of the same, as we were fortunate to realize early on that we needed to first develop and then evolve repeatable, quantitatively-oriented frameworks because us football, hockey and body-building knuckleheads weren’t going to outsmart the market. Indeed, #process has increasingly determined who wins the marginal asset allocation dollar (buy-side) or resource expenditure (sell-side). In fact, between the proliferation of ETFs (read: fee deflation and outflows for actively-managed funds) and the crude implementation of MiFID II (read: the ongoing “commission-mageddon” for #OldWall brokers) you can make the case that the rationalization of resources in our industry is happening faster than ever before. We consider that a good thing and look forward to the opportunity to continue helping our clients do what they need to do to survive. 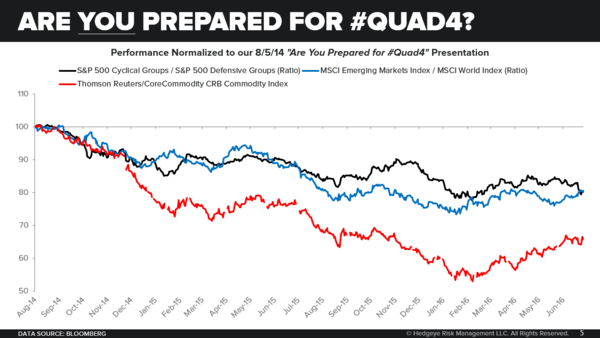 Any investor looking to “survive” 2H18E should be proactively preparing their portfolio for #Quad4, both domestically and globally, at the margins. For those of you who are relatively new to our work, #Quad4 is the GIP Model quadrant whereby growth and inflation are decelerating, concomitantly, on a trending basis. It’s also the quadrant where Mr. Market tattoos investors who enter #Quad4 too long of pro-cyclical exposures. Were NFLX (-5.2% yesterday), with its domestic subscriber adds miss and poor int’l subscriber guidance, OMC (-9.5%), with all its organic growth issues, and FHN (-4.0%), with its weak fee income and loan growth, all one-offs? Perhaps they were. But perhaps they weren’t. From our vantage point, the fact that core business trends in each were deteriorating or, at the very least, materially worse than expected at The Cycle Peak in domestic economic growth is extremely noteworthy. Does that mean everyone should run out to sell down their exposure to risk assets at every price? Absolutely not. Tops, like bottoms, are processes not points. 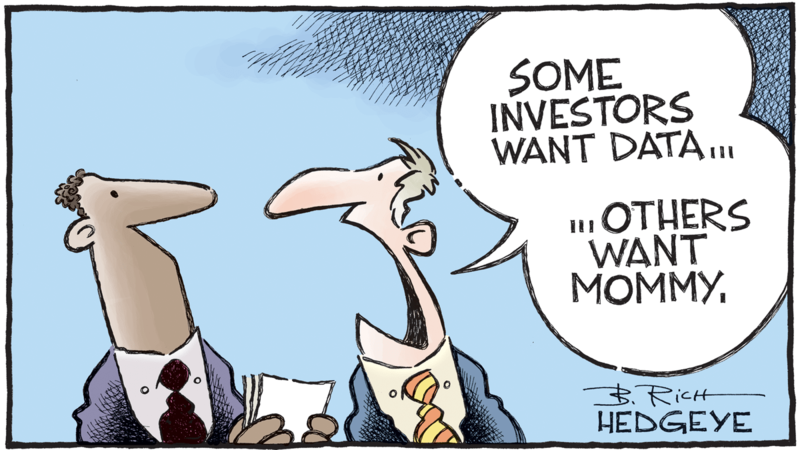 Moreover, our @Hedgeye Risk Range has probable upside of +0.7% to 2832 for the S&P 500 Index, specifically. The 40-60% 30-day implied volatility premiums in each of the other FAANG constituents represent Z-Scores of +0.6-1.1 on a TTM basis and imply the surprise risk is asymmetrically skewed to the upside form an immediate-term perspective. What proactively preparing your portfolio for #Quad4 does mean, however, is that you should be stress-testing each of your holdings for a ~150bps slowdown in nominal GDP growth domestically and a ~75bps slowdown in nominal GDP growth globally over the next three quarters because that’s what our latest forecasts imply. It’s also means you should be diligently sequencing economic and financial market data to confirm or disconfirm our model’s base-case scenario. 10Y UST Yield: down -2bps over the trailing three months… peaking? 10Y German Bund Yield: down -20bps over the trailing three months… breaking down? 10Y UK Gilt Yield: down -21bps over the trailing three months… breaking down? WTI Crude Oil: flat over the trailing three months… peaking? Natural Gas: down -2.8% over the trailing three months… peaking? Gold: down -9.4% over the trailing three months… breaking down? Copper: down -14.7% over the trailing three months… crashing? CRB Raw Industrial Materials Index: -2.6% over the trailing three months… peaking? CRB Foodstuffs Index: -0.9% over the trailing three months… peaking? U.S. Dollar Index: up +6.3% over the trailing three months… breaking out? *It’s also worth noting that every Jobs Report is now “live” per our recent presentation titled, “Jump Conditions in Wage Growth Are Right Around the Corner”. All told, this is not call for investors to rush towards the exits; we’ve rarely, if ever, made calls like that in recent years and would centrally not author that view when Keith is on a well-deserved vacation with his family. Rather, it’s a call for investors to lighten up their gross and tighten up their net exposures, at the margins, and exercise even more prudence in the process of admitting new entrants into their respective portfolios. 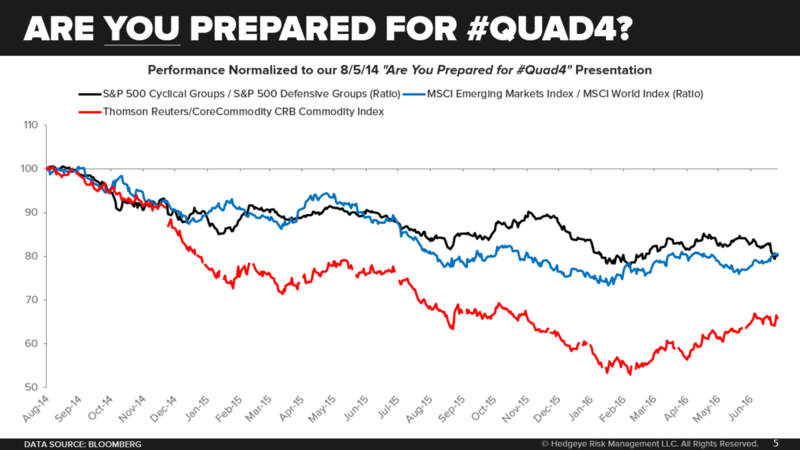 It’s worth noting that the last time we made the #Quad4 call was late in the summer of 2014, ahead of ~18 months of underperformance of pro-cyclical exposures domestically, another ~18 months of underperformance of EM assets and an all-out bloodbath across the commodity complex. While no two GIP Model observation periods are identical, history has a way of rhyming when critical risk management lessons are no longer broadly top-of-mind. Best of luck out there. We’re here to help!